Medical staff help a man who is being treated in a hospital after being injured in a bomb blast carried out by a young, female suicide bomber who detonated her explosives at a bus station in Maiduguri in northeast Nigeria June 22, 2015. The attack was blamed on Boko Haram. In case you were wondering, the group formerly known as Boko Haram didn’t go away. The vicious band of militant Islamists wrecking West Africa is using women and girls to stage a comeback. To date, there have been 53 female suicide bombers in 2015. “No terrorist group in history has used as many female suicide bombers as [Boko Haram] has used this year,” notes Scott Stewart, analyst for geopolitical forecasting firm Stratfor. After one historic presidential election in Nigeria, along with faint mainstream-media spotlight on #BringBackOurGirls, Boko Haram had receded into Western-world unfamiliarity. Newly minted President Muhammadu Buhari talked tough, publicly baking the Islamist insurgency group into his to-do list of national priorities. Voters, understandably eager to put the country’s troubles to rest, showered him with a 70 percent approval rating, with 20 percent in July saying “security has improved.” Buhari obliged with a December deadline to finish off Boko Haram. But with fresh allegiance to the Islamic State group in Syria and a slick, long-name rebrand (they want to be called “Wilayat al Sudan al Gharbi”), Boko Haram has been hitting Nigeria hard with an “unprecedented use” of girls as suicide bombers, according to Stratfor analysis. The numbers are both horrifying and sobering. Since July, there have been nearly 300 deaths caused by suspected Boko Haram suicide attacks, most in the vicinity of Maiduguri, upper-northeastern Nigeria’s largest city. 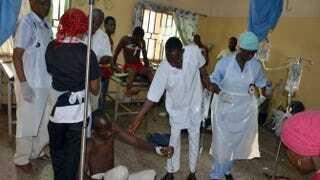 Additionally, more than 70 have been killed in the eastern state of Adamawa. Throughout Nigeria, 170 people have been killed in October alone, bringing the number of deaths to more than 1,400 since Buhari took office this year. Nigerian secret police even reported the recent arrest of 45 suspects planning large-scale bombings in Lagos, the center of the country’s burgeoning economy. But in a disturbing new development, the number of female suicide bombers has now surpassed that of male bombers, with 17 women or girls used to carry out attacks versus 14 men or boys during October throughout Nigeria and neighboring Niger, Chad and Cameroon. Girls identified range in age from 9 to 15. Steep increases in the number of women or girls deployed for suicide attacks were also seen in February, June and July, months that marked the presidential election and the beginning of Buhari’s administration. Lagos-based women’s activist Moyo Hicks tells The Root that Boko Haram actually began using female suicide bombers last year, in an attack on Gombe, Nigeria, in June 2014. Since then, Hicks has observed an uptick in the number of female suicide bombers, most of them teenagers and also some children. Some of the most audacious attacks occurred in October, prompting reaction from Western observers while sending freshly symbolic messages to the terror-wracked nation. On Oct. 16, three women with bombs strapped to their chests killed 26 Muslim worshipers in a Maiduguri suburb. Back-to-back suicide bombings in neighboring Adamawa and Borno states left more than 60 dead. “The apparent use of children—particularly young girls—to commit these attacks is especially heinous, and it provides yet more examples of the horrific measures Boko Haram is willing to take,” said U.S. State Department spokesman John Kirby during a press briefing last week. And there’s little sign that it will end anytime soon. Despite overly optimistic pre-election reports in which the previous president, Goodluck Jonathan, attempted to grandstand a grand deal for the release of the 276 kidnapped Chibok schoolgirls, most remained missing. Some may have already been used to carry out suicide bombings. Sadly, there’s a ghastly strategic method to Boko Haram’s madness. Insurgents have no interest in letting kidnapped women go, with aims to continue the sinister franchise, certain that they can leverage them at points when the military closes in. But holding on to them has become an enormous logistical drag on the terror group, from having to feed kidnapped girls to the cost of moving victims around. So like any club of homicidal, fake-religious wing nuts, Boko Haram decides that it must loosen the weight, indiscriminately using kidnapped victims as suicide bombers instead. Hicks, however, claims that there are quite a few female suicide bombers related to Boko Haram in other ways. Hicks cites the case of Zaharau Babangida, a 13-year-old caught in Kano by authorities last year. Zaharau’s parents initiated her into Boko Haram and demanded that she attempt a suicide mission for a trip to “paradise” or else she’d be killed. Ultimately, female bombers serve the purpose of throwing government military forces off their game, since typically, women and girls are harder to spot as bomb-wearing insurgents than men and boys, especially young girls. With the Obama administration deploying several hundred troops to the region since last year (including 300 to Cameroon this month alone), Boko Haram has found itself boxed in along Nigeria’s borders. Minority Report Nigeria’s Ndi B. Kato, who resides in the country’s capital of Abuja, argues that the recent trend is also reflective of a larger problem in Nigeria, particularly in its northern regions: unequal treatment of women.